From the moment I discovered the tapestry crochet technique, I’ve always thought of it as a very special way of crocheting. It goes slower, it’s more firm and the most important thing about this technique for me is that you can make graphic and geometric designs with it. 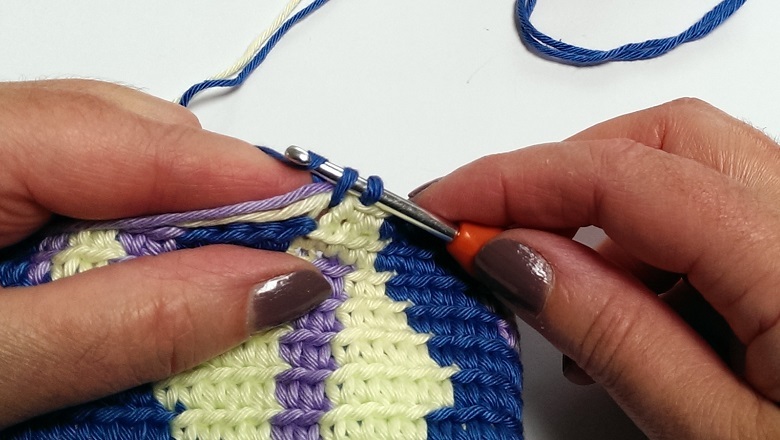 By carrying multiple threads/colours you can create designs without cutting and weaving in your ends. 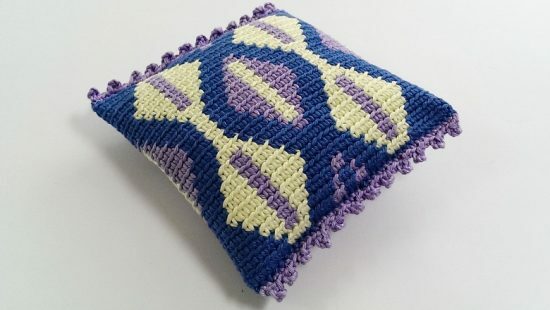 With tapestry crochet you can make for example bags, coasters, potholders and pillows. 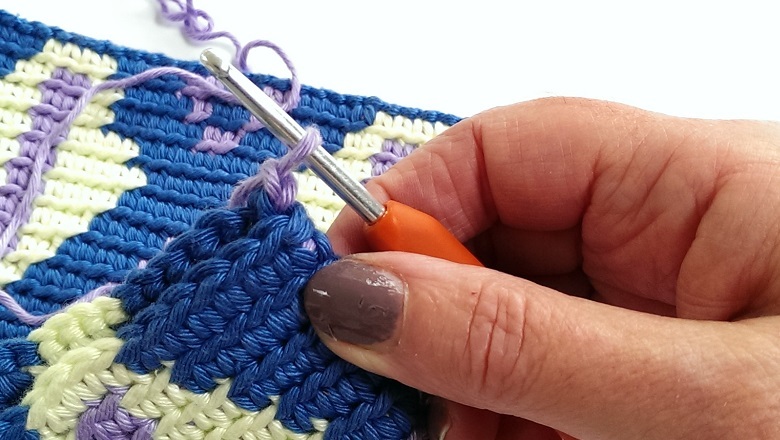 In this first tutorial I’m first going to explain the basics of how to do tapestry crochet. 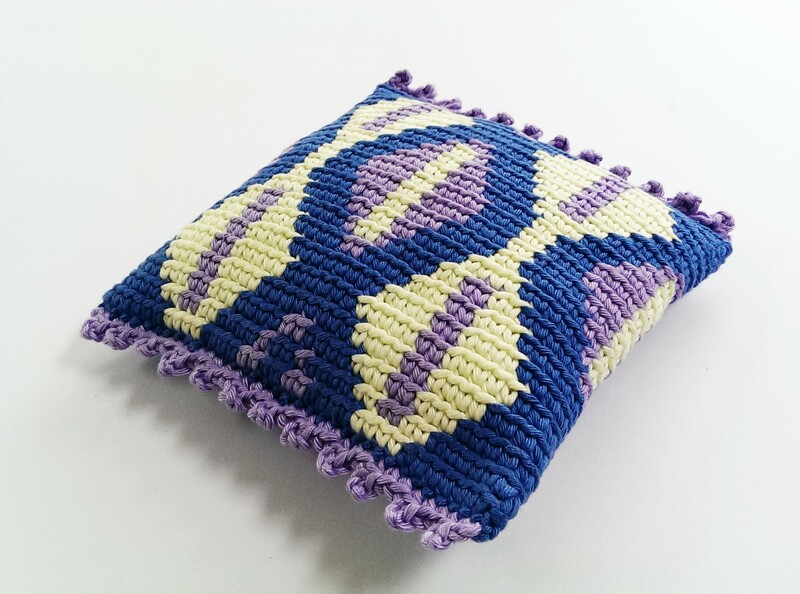 Finally I will describe how you can make a little cushion with tapestry crochet. I have used US standard abbreviations in this tutorial and pattern. 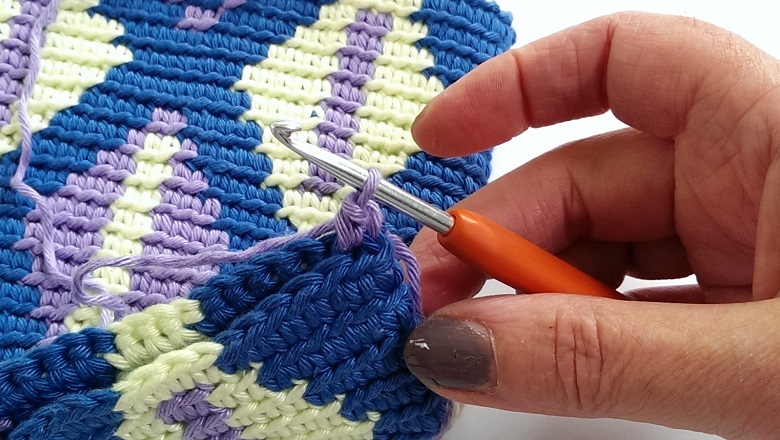 If this is one of your first tapestry crochet projects, choose a thick yarn and a matching hook. 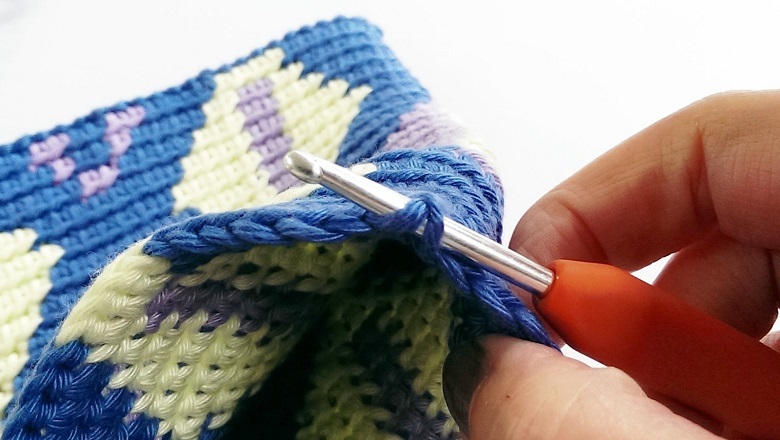 This makes it easier to crochet and to see where you made mistakes. Once you’ve got the hand of it, you can switch to a thinner kind of yarn. The most suitable yarn for a first project should be cotton yarn, suitable for crochet hook 4,00mm/G-6. I chose for Catania Grande this time. 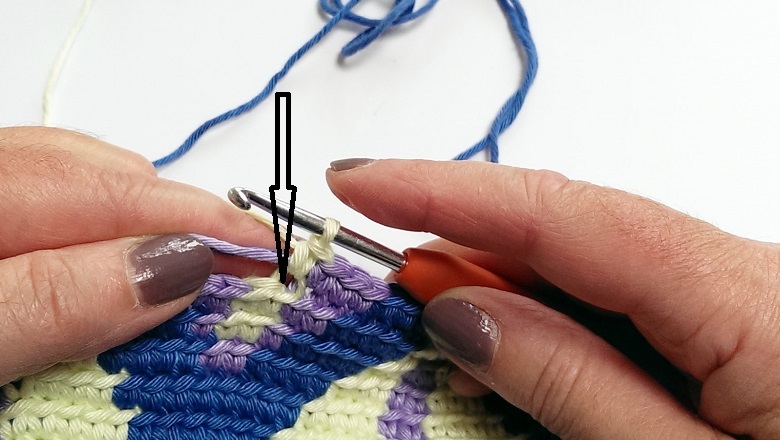 You have to crochet your single crochet stitches by only inserting the hook in the back loop. 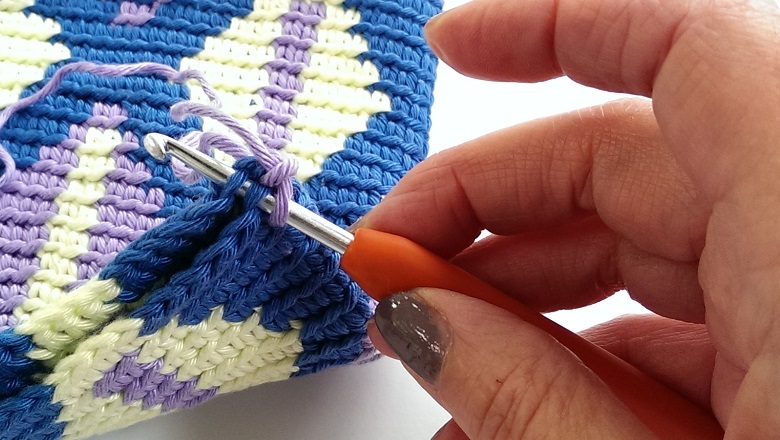 You only crochet in the back loop so your motifs won’t become slanted. 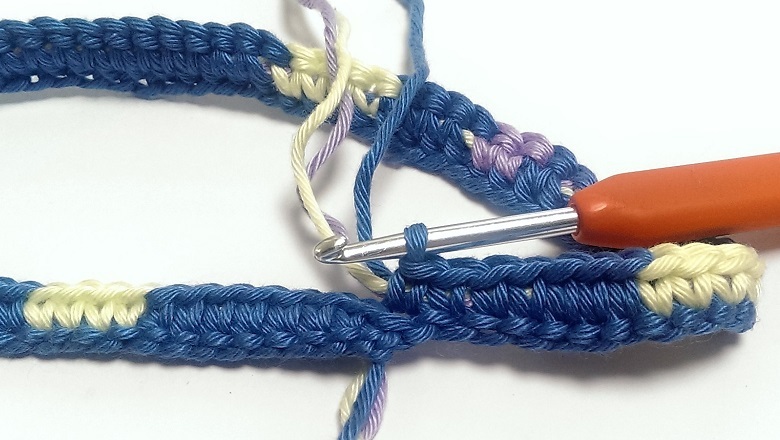 You carry your threads by locking them under a single crochet stitch. 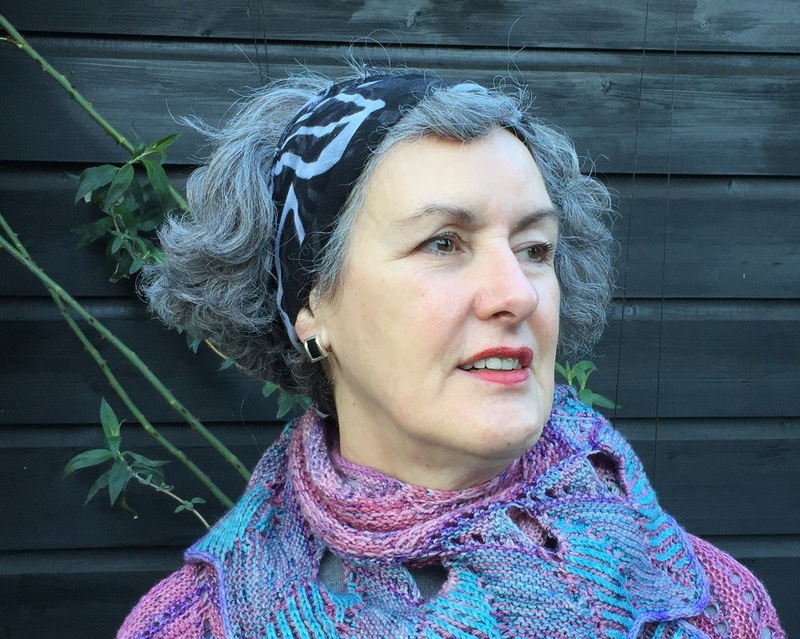 After you have started and the pattern requires all the threads you place your new colours behind a single crochet and over the colour you are working with. Insert your hook in the back loop under the new threads, yarn over and pull through. 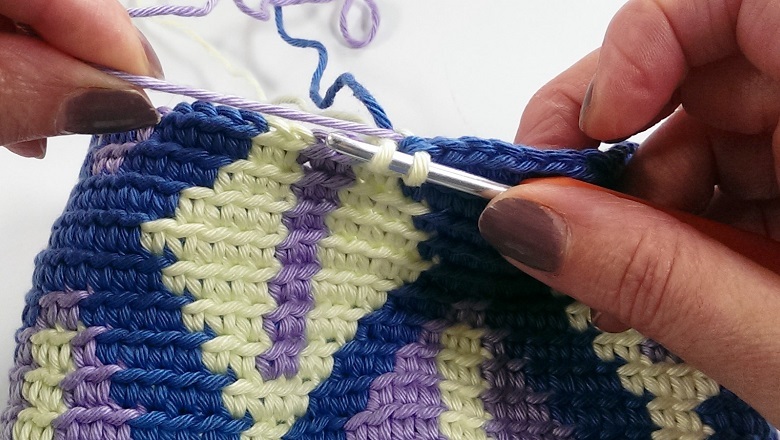 Yarn over, this time you’re going over the new threads, finish your stitch. Your new colours are attached. 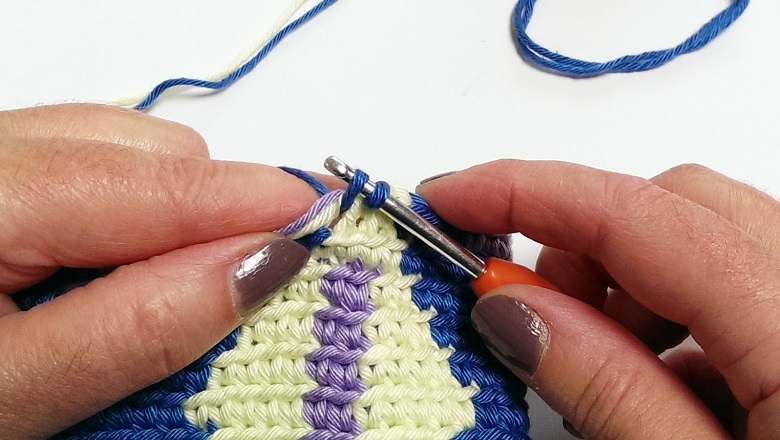 Make sure you crochet every stitch under and over the threads. Don’t miss any, otherwise you will get loose threads at the back of your work. Sometimes a little knot is formed in the colours you’re carrying. 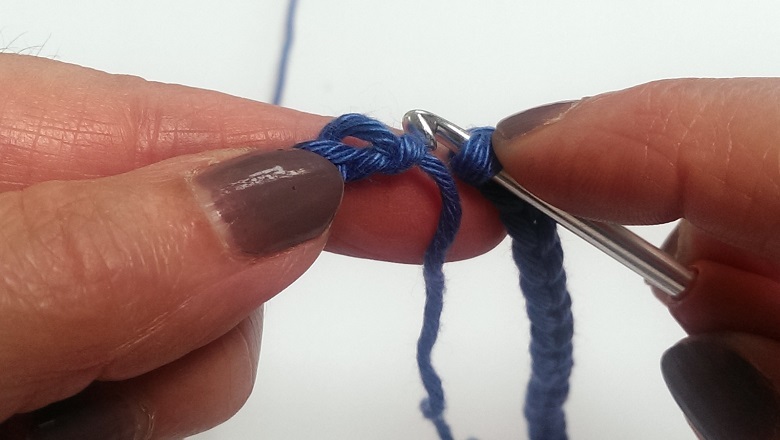 By pulling a little bit at the thread after you have finished your stitch, the knot will disappear. When you have to change colours, you have to finish your single crochet with the new color. 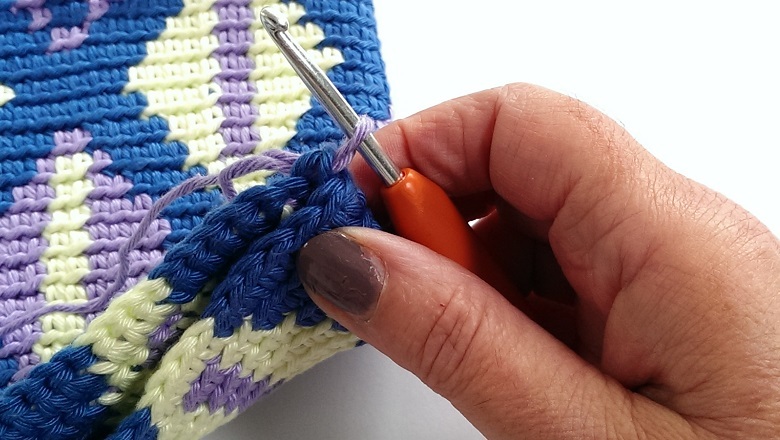 With tapestry crochet you use several colours. 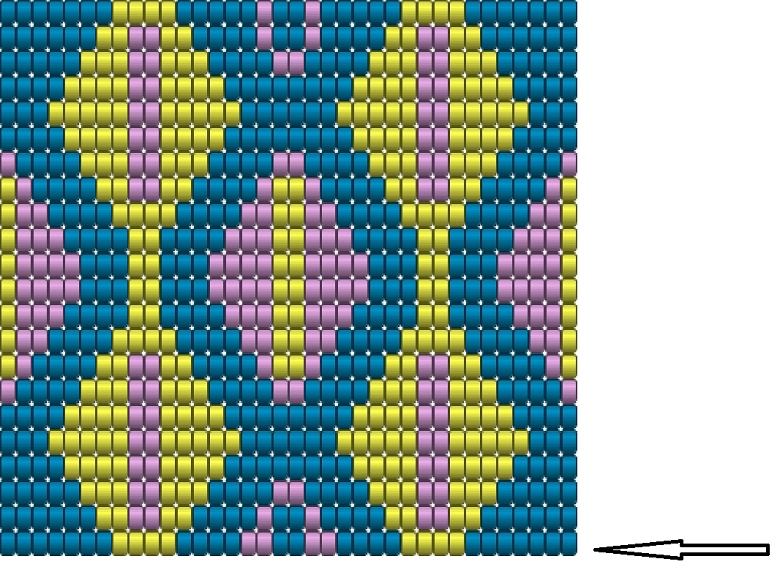 In this tutorial I work with 3 colours/threads. I give each thread it’s own place. I try to keep the threads at their on places. Every time I take a new colour, I put the color I am done with, back to his place where I picked it up from. 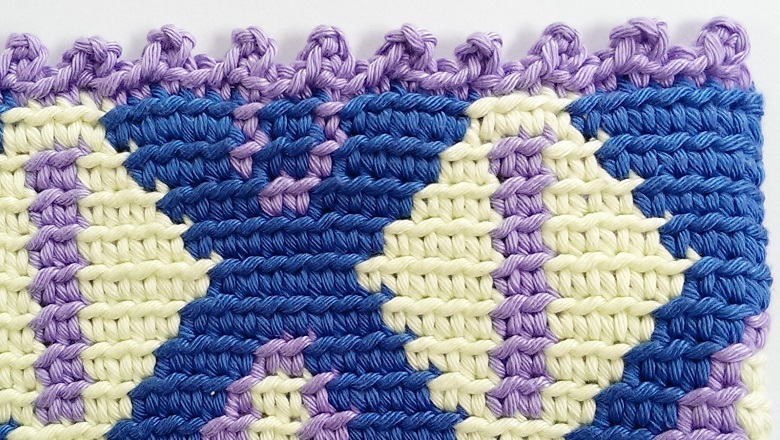 So when I’m ready working with blue, I put the thread back between the yellow and the lilac. 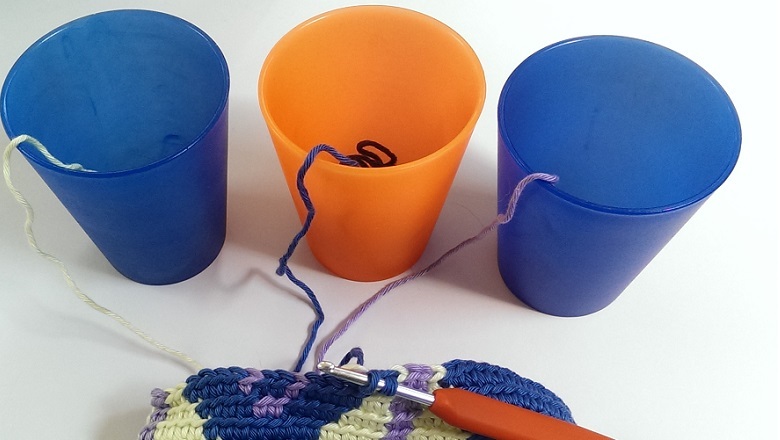 I put my balls of yarn in cups, so they can’t move around. 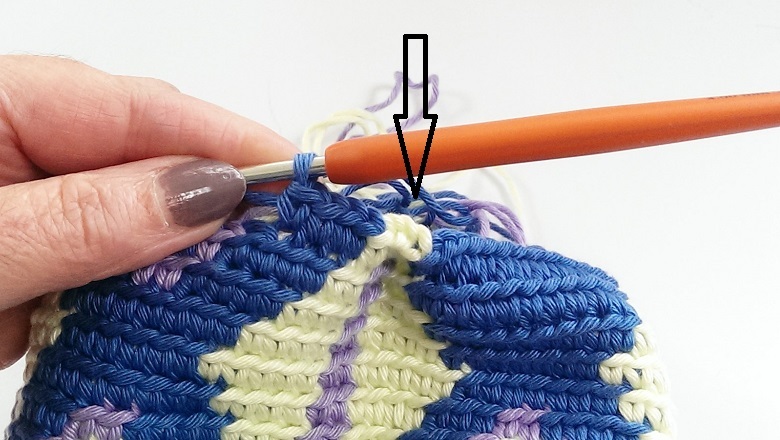 Make sure that you work with the right size crochet hook. 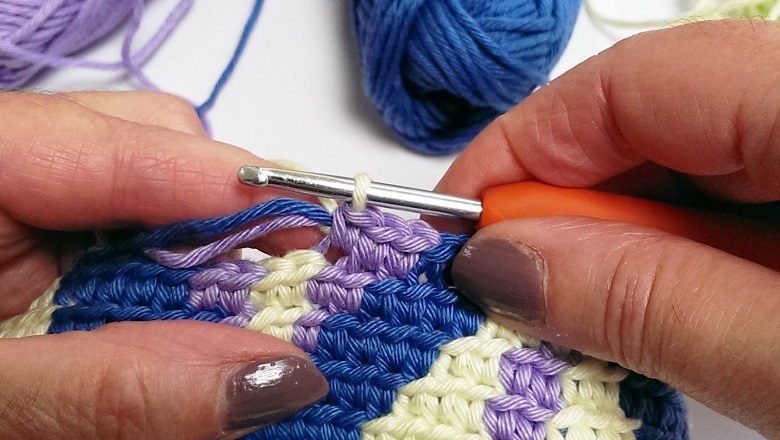 It’s better to work with one size smaller when you crochet loose. 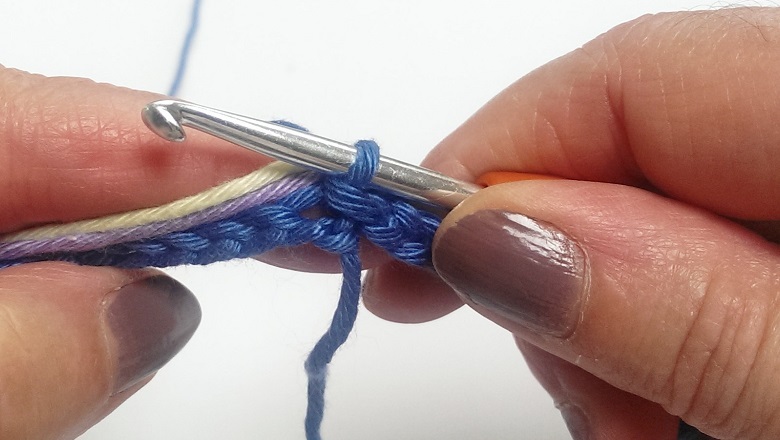 It’s also important that you pull after every 5-6 stitches a little bit at the threads you didn’t use. Just a little bit, if you pull too hard your work won’t be flat anymore. When you don’t pull the threads enough your work will become fluffy and you will see the carrying threads. 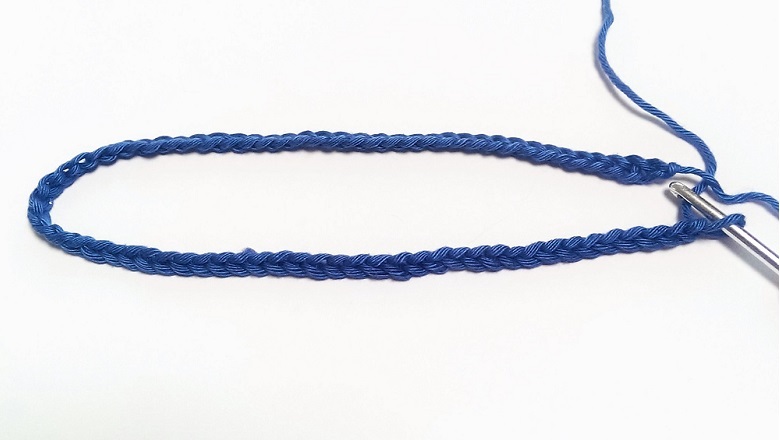 – Cotton yarn in 3 colours. I have used Catania Grande in colours 3261, 3208 and 3206. – A crochet hook 4,00mm/G-6. – Sciccors and a tapestryneedle. Make with blue a slipknot and crochet 72ch. Close to form a ring, by sl st in chain 1. You have to work in rounds, so you will get a “tube”. From here you have to attache the other threads (see above, how to attache/carry threads). 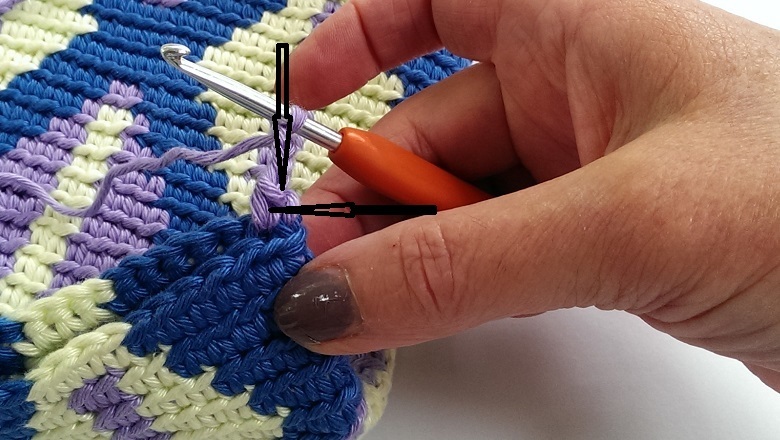 You crochet sc in rounds according to the chart. Your beginning is at the arrow. 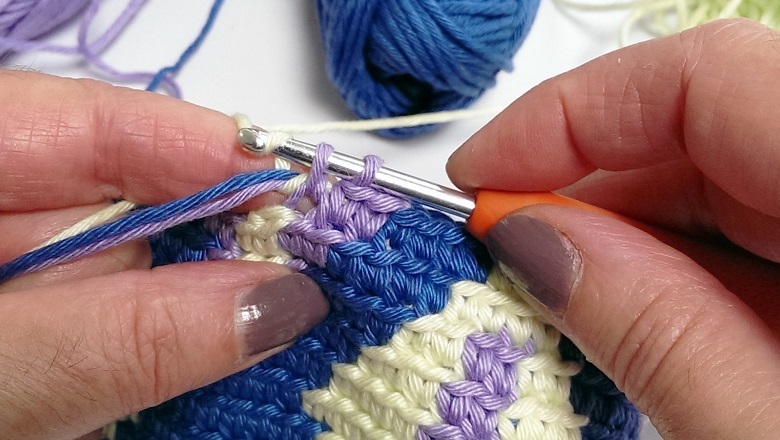 You have to repeat the pattern one time, every round, meaning every round you crochet 72 sc. You don’t finish your rounds with a slipstitch, you just go on. After 22 rows your “tube”is ready. Crochet the last 2 stitches as sl st. Fasten your thread. Now you fold the “tube” flat in a way that you see the image at the front and at the back. 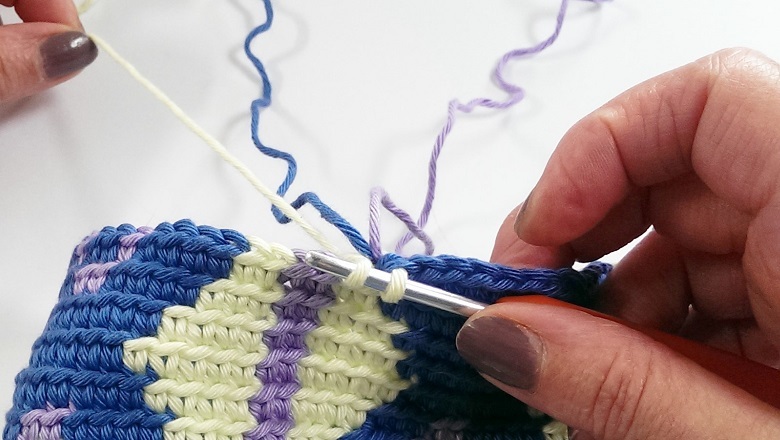 Insert your hook in the first stitch at the front and the back, insert only in the back loops, yarn over, pull through, yarn over and pull through again. 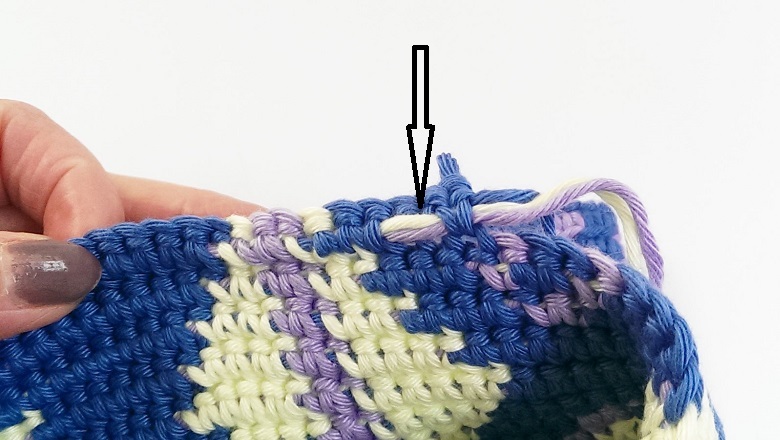 Make in the following stitch a sc and a picot: crochet 1 sc, 3 ch, insert your hook in the front and left loop (follow the arrows) yarn over, pull through and make a sl st.
Crochet each time 2sc and 1sc with a picot. You end the row with a sl st. Fasten off. 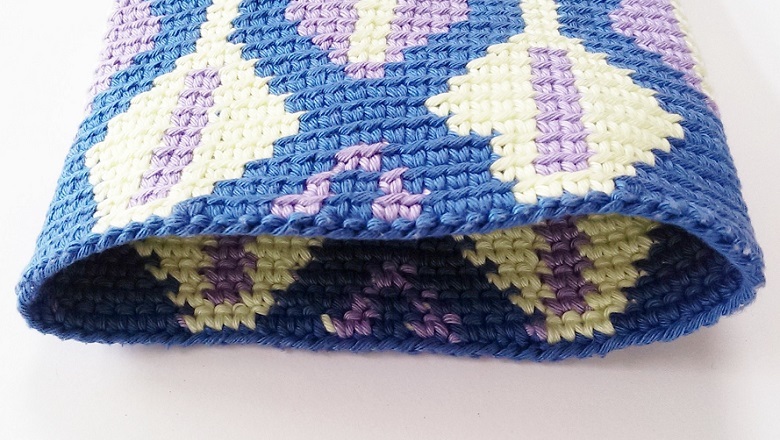 Put your pillowinsert into your cushion and crochet at the bottom a same border. Good Luck and have fun crocheting!!! Thank you for doing such a thorough tutorial. I believe I can be successful at tapestry crochet now. Thanks AnnMarie. Good luck with your tapestry crochet. José ? That’s fantastic. Thank you for this wonderful tutorial! You’re welcome Angela. José ? 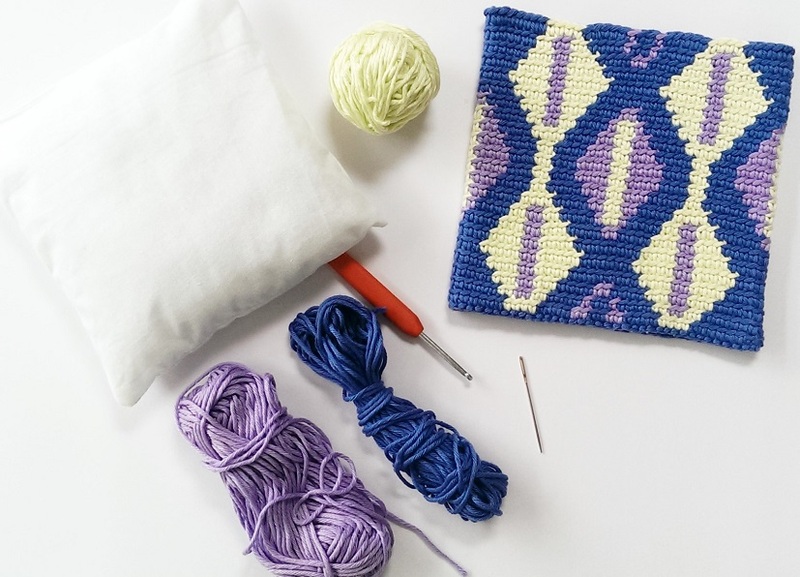 I’ve been itching to try tapestry crochet for a long time, and this is such a great tutorial! Your tapestry crochet is beautiful. Thanks a lot! Thank you Laura. It’s nice to hear that I can be helpfull. José ? Wow lovely! I can’t wait to try this out. Do you have any videos? Hello, thank you! Unfortunately I don’t have any videos. José ? I would love to try learning this. So before I get started how do you figure out the amount of yarn that is needed for a project? I do regular crochet but I’m assuming that this will use more yarn. I don’t figure out the amount of yarn before I get started. You are correct in thinking that tapestry crochet uses more yarn. Good luck with learning, it is so much fun! Amazing beautiful crochet. Thank you for sharing your work. Thank you for the compliment, I hope you’ll get some value out of it! ? Dank je wel José voor deze duidelijke uitleg! Ik durfde nooit aan tapestry haken te beginnen maar nu wel ;). Ik heb nog wel een vraag: je leest wel eens over de ‘yarn over – yarn under’ techniek maar jij gebruikt die niet en toch trekt het werk niet scheef. Hoe komt dat denk je? Leuk om te lezen. De reden waarom het niet scheef trekt, is omdat je alleen in de achterste lus haakt. Het scheef trekken heeft niets met yarn over en yarn under te maken. Ik gebruik deze techniek niet omdat je vasten er anders uit komen te zien, ze lijken dan minder ‘vol’.